Covey introduces the concept of paradigm shift and helps the reader understand that different perspectives exist, i.e. that two people can see the same thing and yet differ with each other. Independence means you are pretty much free from the external influence [and] support of others. ... Independence is the attitude of "I". ... It is the avowed goal of many individuals, and also many social movements, to enthrone independence as the highest level of achievement, but it is not the ultimate goal in effective living. There is a far more mature and more advanced level. The third and highest level in the Maturity Continuum is interdependence. ... We live in an interdependent reality. Interdependence is essential for good leaders; good team players; a successful marriage or family life; in organisations. Interdependence is the attitude of "we": we can co-operate; we can be a team; we can combine our talents. All things are created twice. Before we act, we should act in our minds first. Before we create something, we measure twice. This is what the principle is about. Do not just act; think first: Is this how I want it to go, and are these the correct consequences? 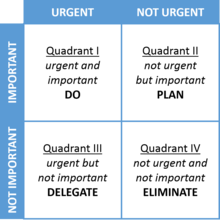 Matrix of importance vs urgency that Stephen Covey and Dwight D. Eisenhower used in deciding where to invest their efforts. The order is important; after completing items in quadrant I, we should spend the majority of our time on II, but many people spend too much time in III and IV. The calls to delegate and eliminate are effective reminders of their relative priority. Use empathetic listening to genuinely understand a person, which compels them to reciprocate the listening and take an open mind to being influenced by you. This creates an atmosphere of caring, and positive problem solving. 1) Ethos -- your personal credibility. It's the trust that you inspire, your Emotional Bank Account. 2) Pathos is the empathetic side -- it's the alignment with the emotional trust of another person's communication. The 7 Habits of Highly Effective People has sold more than 25 million copies in 40 languages worldwide, and the audio version has sold 1.5 million copies, and remains one of the best selling nonfiction business books in history. In August 2011 Time listed 7 Habits as one of "The 25 Most Influential Business Management Books". U.S. President Bill Clinton invited Covey to Camp David to counsel him on how to integrate the book into his presidency. Covey coined the term abundance mentality, or abundance mindset, a concept in which a person believes there are enough resources and successes to share with others. He contrasts it with the scarcity mindset (i.e., destructive and unnecessary competition), which is founded on the idea that if someone else wins or is successful in a situation, it means you lose, because you are not considering the possibility of all parties "winning" in some way or another in a given situation (see zero-sum game). Individuals having an abundance mentality reject the notion of zero-sum games and are able to celebrate the success of others, rather than feel threatened by them. The author contends that the abundance mentality arises from having a high self-worth and security (see Habits 1, 2, and 3), and leads to the sharing of profits, recognition and responsibility. Similarly, organizations may also apply an abundance mentality when doing business. Since The 7 Habits of Highly Effective People's publishing, a number of books appearing in the business press have discussed the idea. In addition to the book and audiobook versions, a VHS version also exists. Sean Covey (Stephen's son) has written a version of the book for teens, The 7 Habits of Highly Effective Teens. This version simplifies the 7 Habits for younger readers so they can better understand them. In September 2006, Sean Covey also published The 6 Most Important Decisions You Will Ever Make: A Guide for Teens. This guide highlights key times in the life of a teen and gives advice on how to deal with them. ^ "The 7 Habits of Highly Effective People" author, Stephen Covey, dies". ^ a b The 7 habits of highly effective people (Videotape). Franklin Covey. 1998. OCLC 42358104. ^ J.,, Scott, S. Habit stacking : 127 small changes to improve your health, wealth, and happiness (2nd ed.). [Mahwah, NJ]. ISBN 9781545339121. OCLC 987616572. ^ Covey, S. R. (1989). Organizing change:Upward Spiral. Free Press. ISBN 0-7432-6951-9. ^ Gandel, Stephen (August 9, 2011). "The 7 Habits Of Highly Effective People (1989), by Stephen R. Covey in The 25 Most Influential Business Management Books". Time. Retrieved January 4, 2011. ^ Harper, Lena M. (Summer 2012). "The Highly Effective Person". Marriott Alumni Magazine. Brigham Young University. Retrieved August 11, 2012. ^ Krayer, Karl J.; Lee, William Thomas (2003). Organizing change: an inclusive, systemic approach to maintain productivity and achieve results. San Diego: Pfeiffer. p. 238. ISBN 0-7879-6443-3. ^ See for instance the chapter in Carolyn Simpson's High Performance through Negotiation. Video of the 7 habits in 3 Minutes.